The first half of QT's long awaited tribute to 1970s misogynistic exploitation movies (which is indeed littered with grainy flickers, choppy cuts in the footage and globular cigarette burns) focuses on a group of attractive but unpleasant girls on a night out in Austin, Texas. While in the process of getting very, very, very drunk (the amount of booze consumed could give you a hangover by proxy) they bandy about a lot of slick, unconvincing, bitchy chatter which makes one suspect that, while he may be the king of male bonding banter, Tarantino can't write female dialogue for sh*t, motherf*cker. 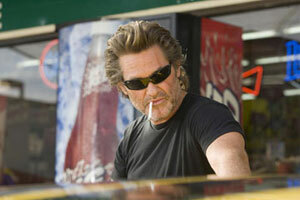 While in a bar, the girls meet a quiff-haired, scar-faced early '80s throwback known as Stuntman Mike (Kurt Russell). He's been a body double in lots of old TV series the girls (and I) have never heard of (yup, Tarantino's back, bombarding us with cult TV references that mean absolutely nothing to anyone without a PhD in 1970s Americana) and he drives a scary, souped up stunt car that's supposedly 'death proof'. For him, maybe but not (sorry folks, spoiler ahead) for the girls, as he ploughs into their car and kills them instantly. So much for the first part of the film. But is the girls' vicious vengeance an empowering display of strong, liberated womanhood or a second dose of old fashioned, sexist nonsense? I suspect the latter, but to be honest, the climactic car chase is so exciting and so well shot, you can't help getting carried away by the whole thing. Perhaps on a second viewing, I'll change my mind – I did about Sin City, after all, which I raved about when I first saw it, but now find really quite offensive due to its rampant, patronising misogyny. Trouble is, I can't decide whether, with Death Proof, Tarantino is cleverly subverting the exploitative genre he's celebrating, or using a gigantic budget to create a film that looks like crap and doesn't have a proper plot. It's certainly nowhere near the standards of Reservoir Dogs or True Romance, although it boasts all the expected QT hallmarks, including his own rubbish cameo, a pounding and eclectic soundtrack and dialogue so razor sharp… well, I was going to say 'it cuts itself' but unfortunately it doesn't, which is a shame, because a bit of cutting is exactly what this film needs. I suspect I may have preferred it in its original, shorter reincarnation, as part of a B movie double feature, Grindhouse, alongside the Robert Rodriguez zombie flick Planet Terror – coming to a special edition DVD near you, no doubt. The final verdict then? Well, as a game of two halves, it scores one star for the first half and four stars for the second. But as to whether, as a whole, I actually like this film, I'm afraid the jury's still out. Which means that Death Proof, for me, is still unproven.